Let Us Find the Problems You Can’t See, BEFORE that Warranty Expires! We hope that you have had a great relationship with your builder. BUT… it’s the problems you can’t see that might cost YOU the most. House Exam Inspection pioneered the One Year Builder Warranty Inspection in 2005 and 2006 in the Fort Worth and Dallas area. We started offering these home inspections, in part, because of what we found at our New Construction Inspections. We often do a “Drywall Phase Inspection” just before the insulation and drywall are installed. Our clients need us to do that, because it’s the last chance to catch any mistakes that are about to be covered up. If a mistake is discovered later it can cost a lot more to repair. Here’s what we found recently at one of these phase inspections for a client building a new home in the Mansfield area. 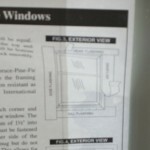 The water proofing was done incorrectly on all the other windows. And the problem would have been covered up the following week when the brick was installed around the house. Errors like this are the cause of moisture and mold issues later. What exactly is a one year builder warranty inspection? Our home inspectors come to your home, prior to the expiration of your one year builder warranty. We perform a full professional home inspection to discover and document problems that you may not recognize. We talk to you at the time of the inspection about what we identified. That same night, we email you a detailed report, including a summary list, of the deficiencies that we identified during our inspection. What Kinds of Problems Have We Found? One client had paid an additional few thousand dollars to have an extra room and bath added above the garage during construction. The builder added the stairway, bedroom, bathroom, and closets, but did not increase the size of the heating and air conditioning equipment, nor did he install any additional equipment. The original equipment was not enough to handle the extra space, and the room temperature never felt comfortable. There was some legal action required on the part of the owner, but the builder finally fixed the problem. 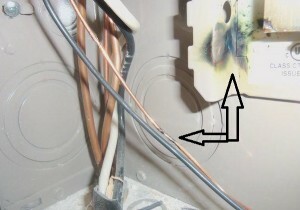 More recently we found signs of electrical arcing inside the main electrical panel. That is a potentially Evidence of arcing inside the main electrical panelserious problem. See the photo below. After the home is complete, you can’t see some of the problems that might have been created by sloppy workmanship, or just plain human error. But, we have experience and training in spotting clues and patterns that help us tell you what might be going on. We do a full professional home inspection, following the Texas Real Estate Commission rules. 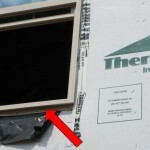 This is the same inspection that we do for someone buying an existing home. Compare that to some of our competitors, who use a checklist, quick-look, watered-down approach. In fact, just for reading this ad, I am going to improve on our already great service. Read on, or call 817-797-2461 now and mention the “Warranty Inspection I R Special.” No other company provides better service than House Exam Inspection, and now we are offering even more. “They were very professional and very thorough. They worked very quickly. They were also very responsive. It was also vcery easy to schedule a consultation with them.” N. Asplund, One Year Builder Warranty Inspection client. You can compare our experience and training against any home inspection company in the Fort Worth Dallas area. I’m Victor Sedinger, founder of House Exam Inspection and Consulting, and since 2004 I’ve been helping new construction homeowners across North Texas, avoid costly repairs that were the result of someone else’s poor workmanship. I am a Professional Inspector licensed by the Texas Real Estate Commission (TREC #7195). I am a past-president of the North Texas Chapter of the Texas Association of Real Estate inspectors, and I am a Certified Inspector with the American Society of Home inspectors (#251929). My son Adam Sedinger is a Professional Inspector (TREC #8894). He joined me at House Exam in 2005 and is now the owner. Adam is also a home energy auditor, certified with the Building Professional Institute. We are both licensed for pest control in the termite category, with the Texas Department of Agriculture (TPCL #598337). Together we have over 30 years’ experience building and remodeling homes, prior to getting into home inspection. Between us, we have inspected more than 7,500 homes. So, as you can see, we are more than qualified and experienced to work for you, to uncover the problems that might end up costing you lots of money. Let the Builder Pay for Those Mistakes ….Not YOU! Did you know that, under Texas law, the builder is supposed to fix the mistakes his crews make! But the truth is: you may not know all those issues, because you are not trained to look for them yourself. Many of the deficiencies that we find in our inspections are hidden from the average homeowner, because they are in the attic, or because they are integral features of the electrical, plumbing, or heating and air-conditioning systems. It’s our job, and our specialty, to locate and identify those deficiencies for you. With our training and our experience we can locate those things in your home that will cause problems later on. You can take the summary list that we present to you to your builder and have him fix needed repairs, BEFORE the warranty expires! So I urge you to call 817-797-2461 for a “One Year Builder Warranty Inspection” from House Exam Inspection. And as an added incentive for you to call now, I’m going to offer you a huge discount to CALL EARLY. Call and mention this website ad, and we will give you 15% OFF the regular price of your inspection. What If Your Builder Says It’s Fixed …. But It’s Not? One of our clients told us that his builder had sent a repair crew twice to repair some damage done by a roof leak. The builder had already had to replace the hardwood floors in the entry hall because of the water damage. Our inspector found the real problem within the first ten minutes, and also found elevated moisture readings under the brand new hardwood floors. After our inspection, the owner convinced the builder to send an experienced roofer to repair the original problem … correctly. So, what are you waiting for? Your one Year builder Warranty will expire soon, and along with it, your chance to have the builder repair any problems they may have created, or for which they are now responsible. We will work for you to discover and identify those problems, coach you on how to present the issues to your builder and answer any questions he may have for us as a result of our report. order your own inspection online 24 / 7.